Check out the latest U.S. Silica, Chevron, and Core Laboratories earnings call transcripts. Investing in oil might not look too appealing to investors these days. After two years of incredibly slow gains, oil prices and stocks associated with oil took a sharp turn in recent months, as concerns of oversupply crept back into the conversation. What's astounding is that many stocks in the oil sector now trade for prices and valuations that are lower than when oil prices were less than $30 a barrel in 2016. As bad as it might seem right now, this could be a good time to look at oil stocks again: Valuations are cheap, and there are reasons to believe that oversupply concerns could be short-lived. So we asked three of our Motley Fool contributors to each highlight a stock they see as a great buy today. Here's why they picked frack sand supplier U.S. Silica Holdings (NYSE:SLCA), oil giant Chevron (NYSE:CVX), and services specialist Core Laboratories (NYSE:CLB). Tyler Crowe (U.S. Silica Holdings): There were a lot of takeaway notes from 2018 when it comes to oil and gas. One that really stood out was how quickly shale drilling has been able to respond to the market. As oil prices rose earlier this year, shale producers turned the tap on fast and shale was able to increase U.S. output by 1.5 million barrels per day from January to October. In 2017, the U.S. Energy Information Administration was forecasting U.S. output to increase 600,000 barrels per day. All of this increased drilling and production did wonders for U.S. Silica's bottom line in the first half of the year. As production soared, though, headwinds such as the lack of pipeline infrastructure and production companies that were exhausting their capital spending budgets faster than expected led to a decline in well completions and in sand demand. 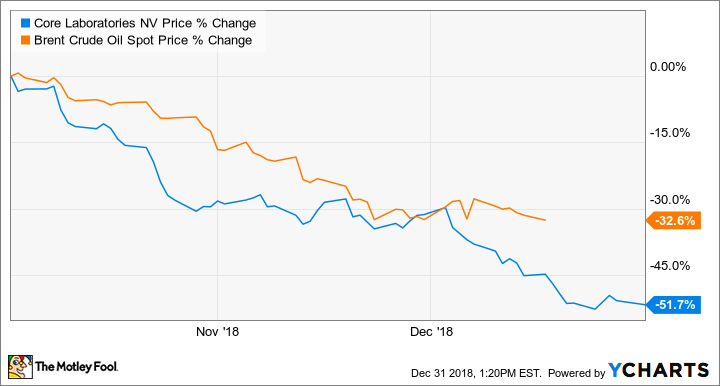 While you can look at this decline as evidence that this is a highly volatile business not worth investing in, I think the bigger lesson is that there's a lot more room for shale to grow in the coming years. Global demand is still increasing modestly, and each year more than 4 million barrels per day of exhausted production needs to be replaced. Shale will fill a large portion of that void in the coming years, which means sand will continue to be a must-have commodity for the oil industry. With the best balance sheet in the business, a high-margin last-mile logistics service, and a large presence selling specialty aggregates to other industries, U.S. Silica is well positioned to weather the ups and downs of this industry, with lots of room to grow. With shares trading at six times earnings, this stock looks like a great buy today. Rich Smith (Chevron): According to energy analysts at Citigroup, oil prices that recently plumbed 17-month lows -- with WTI crude costing as little as $46 a barrel -- are expected to surge by nearly a third over the next 12 months and average $60 a barrel. That means right now is the time to start looking at getting back into oil stocks again -- and perhaps Chevron stock in particular. Why buy Chevron, and not bigger ExxonMobil or smaller ConocoPhillips? Well, consider: At 14 times trailing earnings, Chevron costs only a little more than Exxon or Conoco, but its growth prospects look greater. According to analysts polled by S&P Global Market Intelligence, Chevron is likely to grow its earnings 28% annually over the next five years. 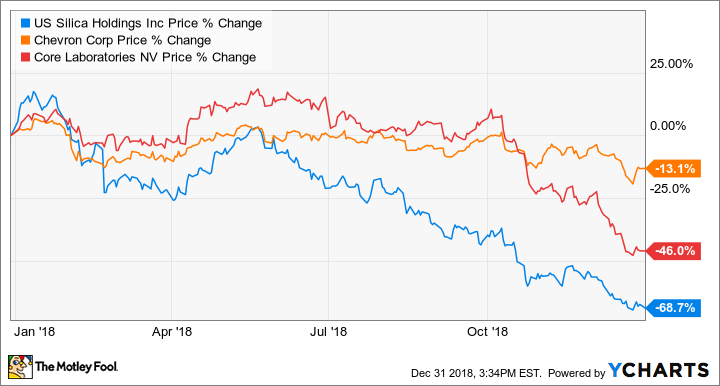 That's a considerable growth premium over the 19% growth rate predicted for Exxon, and four times the pace Conoco is expected to set, at just 7%. What's more, the quality of Chevron's earnings appear to be stronger than what you'll find at Exxon or Conoco. Alone among the American oil majors, Chevron generated free cash flow ($14.3 billion) superior to its reported net income ($14.2 billion) over the past 12 months. Not only is that an indication that Chevron's reported earnings could turn up in future quarters, but free cash flow is real cash profit that Chevron can put to work buying back stock, paying down debt, investing in the future -- and securing its 4.3% dividend yield today. To some extent, the sell-off isn't just a product of fear and uncertainty. Management is expecting to see a sequential decline in revenue and earnings in the fourth quarter. But where Mr. Market sees a reason to sell, I see opportunity. The biggest reason the fourth quarter is likely to be weaker than any so far this year is not because of weakening structural demand, but because of the lack of enough pipelines to get all the oil and gas out of the Permian Basin in West Texas. But this supply constraint will start to be lifted in the second half of 2019, as new pipeline capacity goes online and drilling activity ramps back up. Furthermore, oil companies are starting to sanction more large-scale projects. On the most recent earnings call, the CEO pointed out that there could be a 50% increase in the number of big projects approved this year versus 2017. And that bodes really well for Core Lab. Between the resurgence in long-term projects that generate substantial and recurring revenue and the increase in pipeline capacity in the Permian along with onshore production growth in other plays, Core Lab is in a far better position than the market seems to think. That was enough reason for me to more than double my own stake in this top-tier company.